Superhero movies are everywhere these days, coldly destroying the competition in the movie theaters in the summer. Their omnipresence is even sparking interesting debate from elitist movie critics at the New York Times. With movies starring classic comic book characters like Spider-Man, Thor, Iron Man, and the X-Men, the question rises as to what collection of creative geniuses could have possibly come up with these zillion dollar ideas that millions of people have become fiercely loyal to? The obvious answer is that it boils down to two Jewish guys from New York City, Stan Lee and Jack Kirby. However, if you really deep fry the question, the answer might just boil down to one man, Jack Kirby. The real story of the history of Marvel Comics is not exactly the tale of a happy collaboration between the revolutionary pop artwork of Kirby and the bottomless imagination of Stan Lee. In actuality, the authorship of these legends is a jumbled and bitter history featuring bad work for hire contracts and editorial self-aggrandizement. 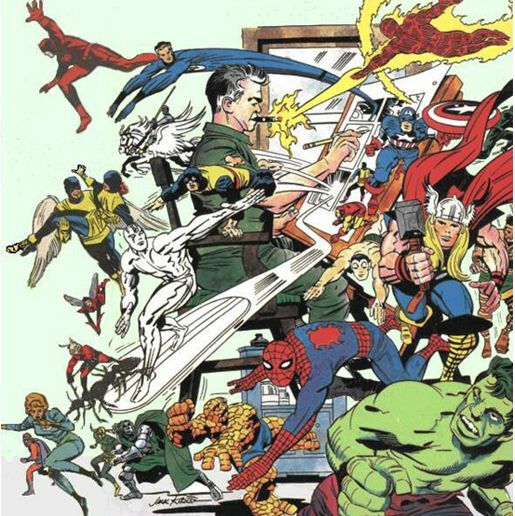 According to Jack Kirby, he basically not only created and drew every Marvel Comic of significance, but plotted and wrote all the dialog, a telling of history that leaves little room for one Stan Lee. Jack recollected Stan as a “bother” and “office prankster,” hired as an office boy by Marvel’s owner Martin Goodman as a favor because they were related, and overtime graduated from office paperboy to over-glorified editor. Stan would change some dialog to make it snappier or funnier, as well as changing character’s names on a whim, but Jack did all the heavy lifting, and because he worked at home, had little contact or interaction with Stan Lee. Evidence speaking to this arrangement is found in this wonderful article published in a Jack Kirby fanzine, which you can read here. In that article, you can read more about the troubled history between Stand and Jack, and see Jack’s original artwork and dialog, as well as the light notes Stan put in the margins. Jack’s version of history is very negative towards Stan Lee, probably to an unfair degree. Marvel Comics never properly took care of Jack over the years, treating him as a standard work for hire artist, and not the genius who revolutionized the way comic books are written and drawn, thus creating in Jack a deep bitterness. A popular story out there is that Jack once entered a toy store towards the end of his life, (he died in 1994), and started to cry because he saw that every toy was of something he created, and he wasn’t getting a dime. Stan, to his credit, did have more of a role in Marvel’s success then Jack would ever admit. While Stan’s role in the creation of the Fantastic Four, the hit that saved Marvel from closing its doors in the early 60s, is questionable, Stan did create Spider-Man with artist Steve Ditko, the greatest superhero in the Marvel roster. Jack, filled with bitterness, would claim for years that he was actually the one that created Spider-Man, a claim knocked down by numerous people close to the situation. I could go on and on, but you can see the depth of wonderful intrigue to this history, and I hope one day, someone makes a smart and serious period piece movie about Stan and Jack, bringing this complicated history to light. In light of this history, the global success of the multi-billion dollar Avengers/X-Men/ and Spider-Man franchises, is a bit bittersweet for two reasons. First, Jack never lived to see it, and the second is that Jack’s name is not as well known as Stan’s, who has received an undue level of credit for something that essentially belongs to Kirby. Anyway, the interview below is an incredible document. Its Jack reflecting on his long life, how he started making comics, his stories from being a soldier in Patton’s army, and his personal cosmic philosophy that influenced all of his creations. The interview took place in 1990, and while the interviewers do a wonderful job in allowing Jack to speak, as well as asking pertinent questions, the callers at the end basically have no idea of who Jack Kirby is, and thus ask a series of ludicrous questions, that are equally humorous and slightly disrespectful to a man of Jack’s stature. It’s a great interview and well worth listening to because this is the man who facilitated the enjoyment of millions of people’s childhoods. So, enough yapping, here is Jack Kirby, King of Comics. Oh, the transcript of the interview is here, handy if you want to follow along more closely. The video is courtesy of the Jack Kirby Museum, an incredible YouTube channel started by Jack’s family that fans of Jack should all subscribe to. Powered by WordPress v 5.0. Page in 0.496 seconds.